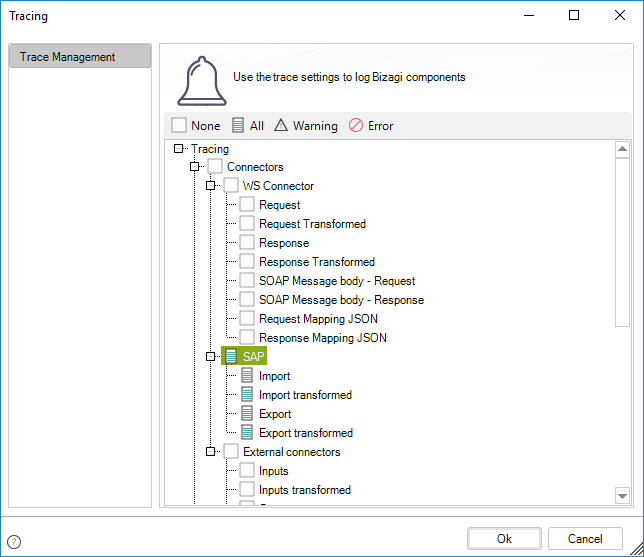 When configuring SAP's BAPI invocations in Bizagi, you can rely on several features for error control and diagnostics. One of these features is the use of Traces when you detect there is an issue with the SAP BAPI invocation, and you want to retrieve further detail. When you are debugging a SAP BAPI invocation (in Development environments) or want to retrieve further details about a failed invocation, you can turn on the SAP traces. You can enable Interfaces traces at any time, but we strongly recommend that you enable them only when they are needed and afterward disable them. Changes in this configuration require a reset in your Work portal services. Enabling these traces helps you track down, after an error in the application, the exact point where the error has happened. There are four points where details are logged and you can diagnose if there is a problem with your SAP BAPI (target's invocation), or when transformations were being applied to the information. The following traces are logged in chronological order. Writes aa XML-structured log with information of how the mapping is done for the Import parameters (involving transformation functions). The timestamp is set as yyyyMMddHHmm. Writes an XML-structured log with the business information retrieved from Bizagi. Writes an XML-structured log with information of how the mapping is done for the Export parameters (involving transformation functions). Writes a XML-structured log with the business information incoming from the SAP BAPIs export.